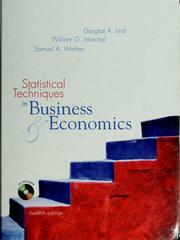 245 1 0 %a Statistical techniques in business & economics / %c Douglas A. Lind, William G. Marchal, Samuel A. Wathen. 260 %a New York : %b McGraw Hill, %c cop. 2005. 300 %a XV, 800 s. : %b il. ; %c 27 cm + %e CD-ROM. 500 %a Na okł. international edition.